Your landlord can evict you for a variety of reasons, including failing to pay your rent, violating the terms of your lease or remaining on the property after the expiration of your lease. Eviction is typically a matter of state law. A landlord can not evict you for any reason not supported by state law -- and he must go to a state court to win a judgment of eviction against you. Your landlord must give you warning, typically known as a "Notice to Quit" before evicting you. If there is anything you can do to remedy the problem, like paying back-owed rent, the Notice to Quit will indicate this and you will have the opportunity to comply. If you fail to remedy the issue, the landlord can't simply physically throw you out. First, he must go to court and obtain a judgment of eviction. Depending on the circumstances, the judgment might provide for "reinstatement upon satisfaction," meaning that if you pay the landlord what he's owed, he must reinstate your lease. When the court grants the landlord an eviction judgment, it also gives her a writ of possession. This writ informs you, the tenant, that a law enforcement official, typically a sheriff, will remove you from the property if you are not gone by a certain date. Rules governing writs of possession and eviction can vary among states, but generally, the sheriff serves you with the writ himself -- and then you have a certain amount of time to leave the property before he returns to put you out. Bankruptcy is generally designed to put a hold on your debts until you can find a way to pay them. However, if you were already served a writ of possession, filing a bankruptcy petition will not stop the eviction from going forward. However, you can stop your landlord from evicting you if within 30 days of filing your bankruptcy petition, you certify to the court handling the eviction that state law allows you to pay your landlord the overdue rent that caused him to initially file the eviction proceeding, deposit the amount of any rent due with the bankruptcy clerk and file a certification document, which states that you deposited overdue rent with the court and your landlord's judgment provides for reinstatement by satisfaction. If you make any false statements on this certification, you might open yourself to perjury charges. If you file for bankruptcy before your landlord files an eviction lawsuit against you and he does not have a judgment of possession, an "automatic stay" immediately goes into effect for 30 days. The automatic stay gives the bankruptcy court time to sort out your finances so you can divide what assets you have fairly among your creditors. If your landlord sues you for back rent, eviction or takes possession of the property based on the debts you owed before you filed bankruptcy while the stay is in effect, he is in violation of the stay and could incur penalties, including paying your legal fees as well as punitive damages. However, your landlord can send you a demand letter if you fail to pay rent that becomes due after you file for bankruptcy. If you are unwilling or unable to pay it, your landlord has the right to ask the bankruptcy court to lift the stay regarding eviction -- and the court is likely to lift it. 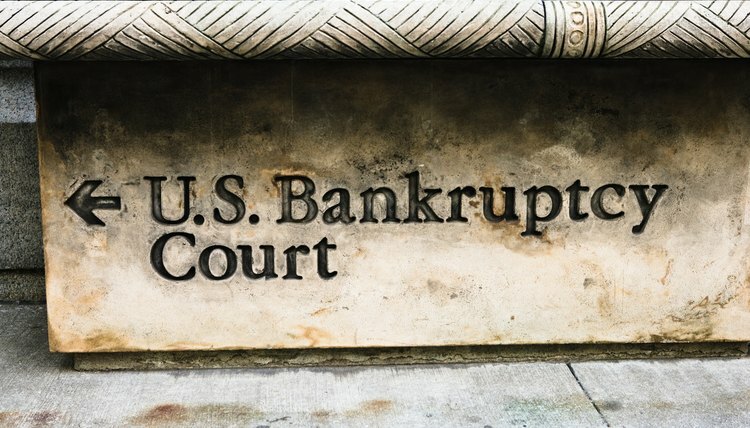 Bankruptcy Law Network: Can I Use Bankruptcy to Stop an Eviction Proceeding? In Colorado, your landlord may issue a Notice to Vacate if you are chronically late in paying your rent. As receiving this notice is a preliminary step to eviction, you may be only days away from being thrown out of your apartment. Depending on how quickly you act, filing bankruptcy may either afford you a brief delay or give you an opportunity to avoid eviction and remain in your residence.